MomsRising.org | We need Child Care for All Families Now! The struggle is real when it comes to finding high-quality, affordable early learning opportunities for our little ones. Childcare and pre-K costs are sky high—in fact, in 30 states and the District of Columbia, infant care costs exceed the average cost of college tuition. Approximately half of American families live in a “childcare desert”, meaning they can’t access the quality childcare they need. Additionally, early learning providers, 94% of whom are women, are struggling significantly since childcare is one of the lowest paying industries in the United States. 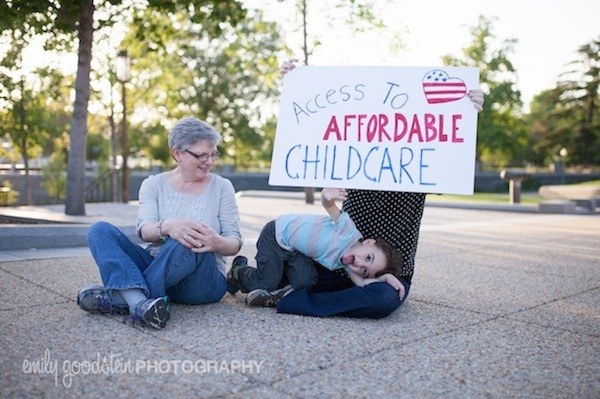 This is why we are inspired and thrilled that Senator Patty Murray (WA), Senator Bob Casey (PA), and Representative Bobby Scott (VA) are taking a stand to address these issues by introducing the Child Care for Working Families Act. This legislation will address our nationwide early care crisis by lowering childcare costs for low-income and middle-income families, supporting universal pre-K programs for all 3 and 4 year-olds, and significantly improving compensation and training for the childcare workforce to ensure that our nation’s teachers and caregivers have the support they need. **Sign our letter NOW encouraging your members of Congress to create a brighter future for our littlest learners, workforce, and economy by supporting the Child Care for Working Families Act. The struggle is real when it comes to finding high-quality, affordable early learning opportunities for our little ones. Childcare and pre-K costs are sky high—in fact, in 30 states and the District of Columbia, infant care costs exceed the average cost of college tuition. Approximately half of American families live in a “childcare desert”, meaning they can’t access the quality childcare they need. And early learning providers, 94% of whom are women, are struggling significantly since childcare is one of the lowest paying industries in the United States. We need real solutions to this national crisis, which is why I am asking you to co-sponsor and support the Child Care for Working Families Act introduced by Senator Patty Murray, Senator Bob Casey, and Representative Bobby Scott. Lower childcare costs for low-income and middle-income families to a maximum of 7% of household income through a sliding scale, regardless of how many children they have. Significantly improve compensation and training for the childcare workforce to ensure that our nation’s teachers and caregivers have the support they need. Assist parents in selecting the childcare provider of their choice—whether that be a center or family childcare home, friend, relative, or neighbor. In addition, improving care during non-traditional hours to help meet the needs of working families. Support for more inclusive, high-quality childcare providers and centers for children with disabilities. Help all Head Start programs meet new expanded duration requirements and provide full-day, full-year programming. Stand up for our littlest learners, working families, child care providers, and our economy by supporting the Child Care for Working Families Act.